Earlier today, we reported that Apple is cutting its iPhone 4 orders ahead of the launch of a new iPhone model. Based on the information previously available, we speculated that the next iPhone would be a relatively small upgrade. 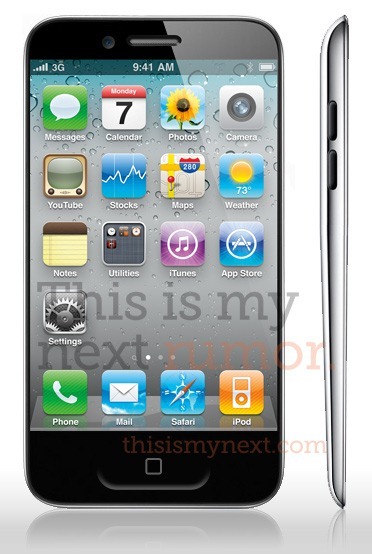 Now, reports are indicating that in fact it will actually be a major one, likely to be known as the "iPhone 5". Although not much information is known at this point, the new handset is expected to include a brand-new case design, despite previous rumors that it wouldn’t. According a "reliable source", the new case design will be "radically new", which makes us wonder what it will actually look like. Just last month, we reported that Apple had purchased 200-300 glass cutting machines to be used by suppliers. That immediately points to a future handset with a curved glass screen. While glass cutting is expensive and can often lead to unexpected results, Google’s Nexus S already includes a curved-glass screen for better comfort. As Apple looks to other makers for ways to improve its user experience, a curved glass screen could definitely make sense. Other sources are also pointing at a larger screen while not increasing the size of the device, possibly making it edge-less, for better movie viewing experience. HTC has experimented with this before, although larger screens have always led to larger devices. The size of the current iPhone is seen by many as "perfect", I’m not sure how well a larger form factor would sit in with the iPhone user base. It’s not clear what the rest of the casing will look like, although we can speculate that it will likely reverse some of the exterior antenna design found on the iPhone 4, which led to dropped calls when the handset wasn’t "held properly". Could the new design be even thinner than before? This new report has also revealed a possible new release time frame. The consensus was that we’d only see a new device in September, but this source estimates that we’ll see an unveiling at a special event in mid-August, along with a release later that month. It’s not clear whether the traditional September Music event will happen a little sooner, or whether we’ll see an actual separate event the month before. Of course, there’s also the possibility that there might be no truth to this story, but the source who leaked this is allegedly very credible. We’ll have to wait and see, folks.